Yelena Galstyan, a magazine journalism student at Syracuse University, is taking a study abroad semester at the University of Queensland in Brisbane, Australia. In her third piece in a series about her observations in the land down under, she hops through Australia’s islet havens. Fraser Island, considered to be the world’s largest sand island, is located on the southern coast of Queensland, just north of Brisbane. To get there from the mainland, you have to commute to the tip of the coast by car, hop on a ferryboat, and have your 4-wheel-drive ready. The only thing that interrupts the long, white beaches are the cars whizzing by. The beach doubles for a highway, so look to your left and right before you dip your feet in the water or reel in for a fish. The beaches are great for sunbathing, checking out the sunset, or even for moonlight strolling, but unless you want to get swept out to sea, don’t go further than knee deep. The currents are strong and treacherous, so swimming on the island is a death wish. And if the waves don’t get you, the jellyfish will. This area is known for deadly marine stingers, so be vigilant. 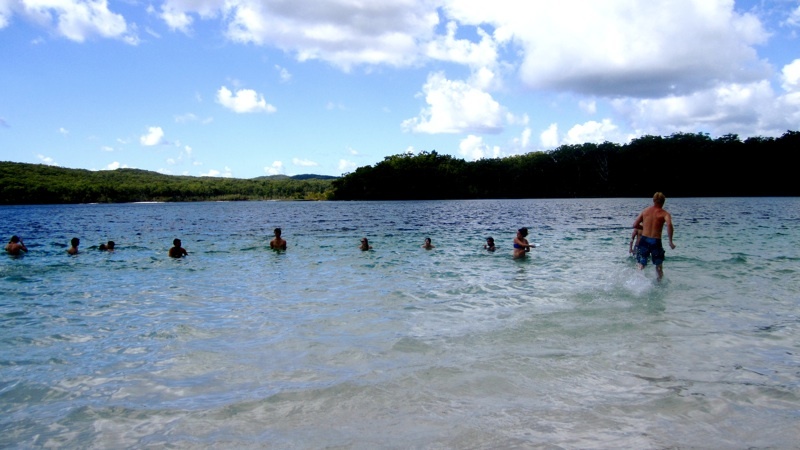 To cool off, take a dip in one of the island’s freshwater lakes. There are over a 100 to choose from; some tea colored, others crystal clear. I recommend swimming in the fresh blue waters of Lake McKensie or visiting Lake Boomanjin, the largest perched lake in the world. 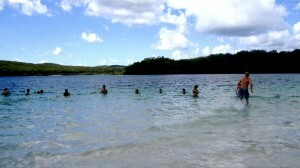 The water on Fraser Island has been sand-filtered over the centuries, making it clean enough to drink. 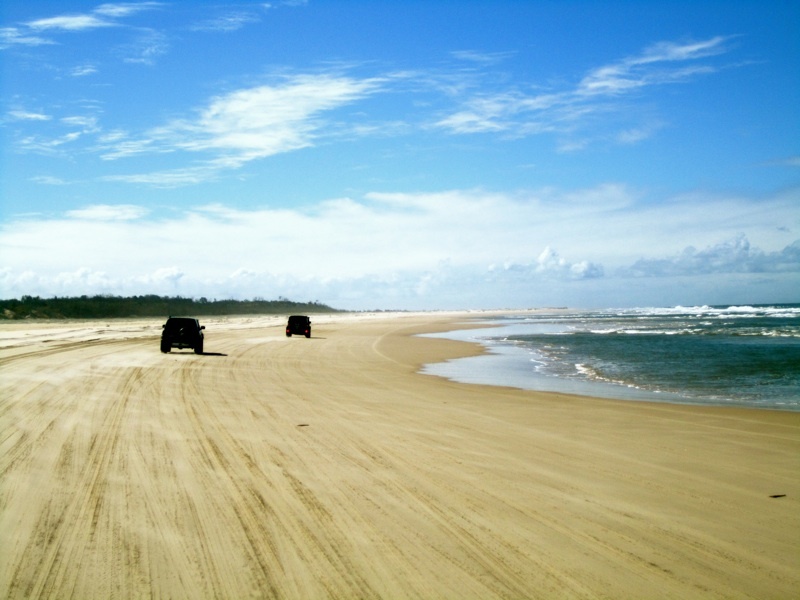 If you’re feeling adventurous and want to get some exercise, bush walk (hike) to the Kirra sand blow and swim in Lake Wabby, the deepest lake on Fraser Island with much aquatic life including heaps of catfish. Don’t leave the island without getting a taste of its different environments. Fraser has rainforests, eucalyptus woodlands, mangrove forests, swamps, sand dunes, and coastal heaths. Unlike many sand islands, life is abundant here, and over thousands of years, the flora and fauna adapted to live in these unique conditions. As my friends and I walked through the schlerophyl forests we couldn’t help but feel like we were in a movie. Something about the trees and forests is eerily reminiscent of Jurassic Park or even Lord of the Rings. Keep an eye out for dingos (wild dogs) and yellow-spotted guanas (giant lizards) as they are common island inhabitants. To experience Fraser Island full-on, book a three day tour with Sunset Safaris. This Australian tour company has the friendliest staff and the best four-wheel drive buses on Fraser. 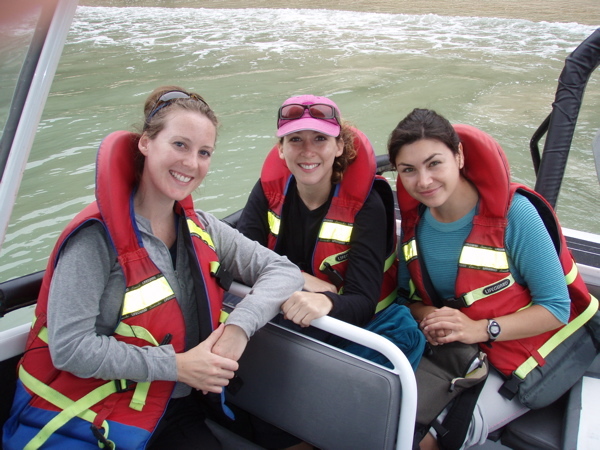 Other sites to check out include Eli Creek, S.S. Maheno shipwreck, Champagne Pools, and Indian Head. The Whitsunday Islands are a set of 74 islands located in the heart of the Great Barrier Reef, off of Queensland’s tropical coast, just north of Mackay. A bunch of the islands have fancy resorts, but unless you’re willing to splurge over a grand a night to have your beach towels refrigerated, I suggest staying in Airlie Beach, the kick-off point to all the islands. If you’re a backpacker like me, stay at Magnums. I’ve traveled all over Australia, but this is the best backpacker hostel I’ve ever stayed at. The individual cabins are surrounded by lush greenery, making you feel like you’re lodging in the middle of the rainforest. Magnums also has a restaurant, a bar/nightclub, and an outside live performance area. Airlie Beach consists of a main strip that starts at the marina with heaps of shops, bars, and restaurants, and, best of all, a lagoon for swimming and sunbathing. 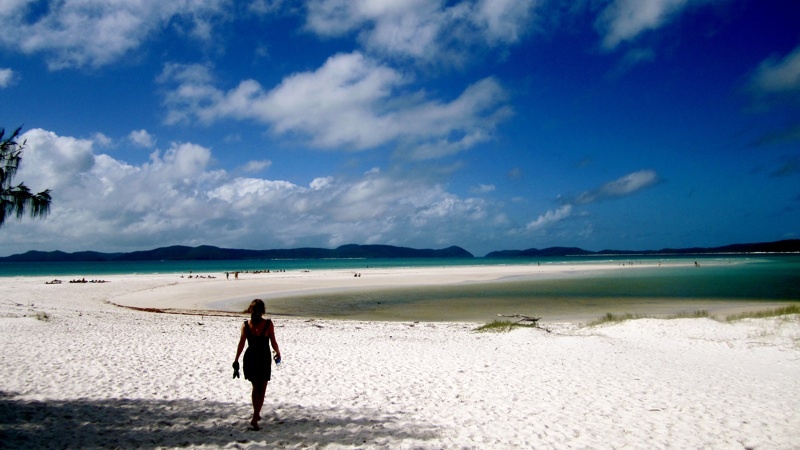 What attracts tourists from all over the world to Airlie Beach is its friendly, relaxed atmosphere, and size. There is plenty to do, but it’s by no means overwhelming. Stay on Airlie for a few days and you’ll feel right at home. If you’re a partier, start at Magnums around 7 p.m., scoot down to Beaches around 9, mingle at Shenanigans, and end your night at Mama Africa’s, the local nightclub. Before you check out the nightlife, book a sailing trip, and, before you party hard, remember that boats leave early in the morning, often around 8 a.m. 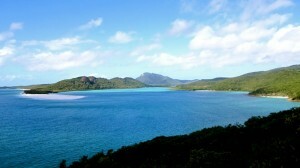 The Whitsundays are a sailing mecca. There are plenty of sailing trips to choose from depending on how many days you’d like to spend out at sea. If you’re staying at a backpackers’ hostel, they’ll often offer good deals since they have partnerships with individual sailing companies. Snorkeling in the Whitsunday Islands is a must. Sure, you could also go diving, but the reef is really shallow and the visibility is great. You can find the underwater playground filled with colorful fish, coral, and other marine life just a meter deep, so save yourself a few bucks and take advantage of the snorkeling included on most sailing trips. 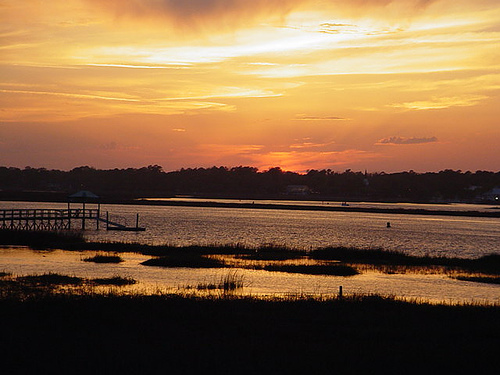 Before you book, make sure your tour takes you to Esk Island for sundown. Sit on the island’s beach, made entirely from dead coral, and find your favorite seashell. Then watch over the horizon and thank your lucky stars that you’re sitting on this remote island off the coast of Australia. Most of the sand on Fraser Island is pure silica, but Whitehaven Beach boasts the highest percentage—about 98 percent. If this means nothing to you, just imagine a beach filled with fluffy, powdery white sand surrounded by turquoise waters. The sand is so genuine you can polish your pearly whites with it. Lastly, don’t get overwhelmed. 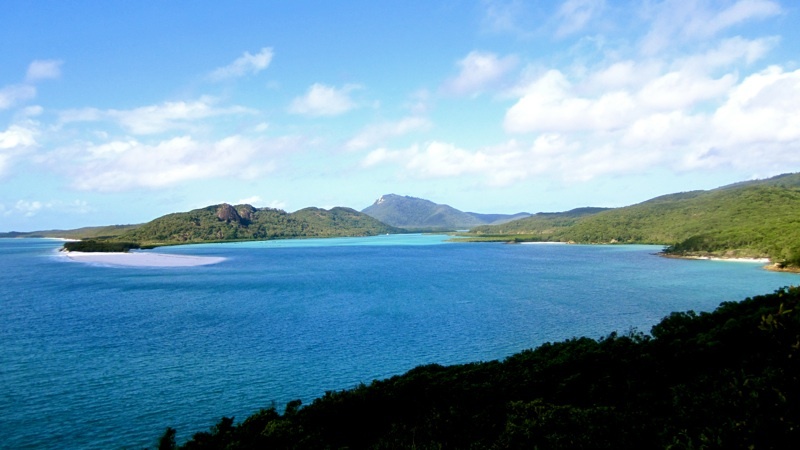 Although there are dozens of islands in the Whitsundays, under 10 are accessible, and each island have its own attractions and reasons to visit. Do a bit of research. If your sailboat doesn’t take you to an island you’d like to check out, pay approximately $60 to use the local transport system that will. While in the Whitsundays, visit these places: Daydream Island, the lush rainforests in Eungella National Park, and Hamilton Island. When Tiger Woods got busted for cheating on his wife Elin Nordegren, he allegedly bunked out in the Whitsundays for a week. Bill Gates is said to own two yachts docked in a Whitsunday marina, with a few helicopters to go with them.